Azerbaijani composer Kara Karayev, one of Shostakovich’s most successful and well known students, once said that ‘from the very beginning, East and West co-existed in me’. These two ballet suites are ample demonstrations of the truth in that statement. The Seven Beauties was the first ever full-length Azerbaijani ballet and was created from the symphonic suite of the same name which he had composed in 1949 inspired by the twelfth century poet Nizami’s poem written in 1197. In this suite from the ballet we are lead in with an energetic Waltz which is reminiscent of Shostakovich’s ballet suites and is full of boldly stated tunes. This is followed by a beautifully lilting Adagio with a haunting theme on a solo horn. The Dance of the Clowns is a complete contrast in the form of a bubbling scherzo. Then after a short introduction the seven beauties of the title appear. They are paraded before us as living portraits which hang on the walls of an ancient ruined castle where the Shah Bachram Gur lived with his seven wives. Each of these highlight the interest Karayev had in the musical traditions of so many countries and cultures. The Indian Beauty is represented by a solo flute. There’s the fiery Byzantine Beauty whose furiously paced dance eventually becomes subdued. The Khorezmian Beauty hailed from the region of Khiva which is today part of Uzbekistan and whose dance is full of energy. The Slavonic Beauty’s theme is an immediately recognisable Russian folk melody. The Maghrebian Beauty has a ‘Spanish’ flavour complete with the evocation of a bolero accompanied by castanets. This shows how the music of mainland Spain was heavily influenced by North Africa where the countries of the Maghreb (Algeria, Morocco, Tunisia, Libya, Mauritania) are to be found. China is also shown through an energetic dance once again using a flute solo. The final panel is The Most Beautiful of the Beauties with a lovely solo oboe together with harps and clarinets. 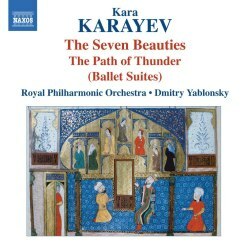 There is much in Karayev’s melodies generally that reminds one of the Armenian composer Aram Khachaturian (1903-1978) with shades of his Sabre Dance from his ballet Gayane. A greater contrast in source material and musical influences could hardly be imagined when it comes to Karayev’s second ballet suite. We move from 11th century poetry to 20th century apartheid South Africa for a tragic story of forbidden love; in this case between a young mixed-race teacher from a rural village and a young white girl and daughter of the local Afrikaner patriarch. The year of publication of the novel The Path of Thunder by Peter Abrahams which inspired Karayev to write the ballet is a significant one since it was 1948: the year the apartheid laws came into force. In the Soviet Union it was also the time of the infamous decree by Zhdanov denouncing ‘formalism’ that so affected composers such as Prokofiev, Khachaturian and Karayev’s teacher Shostakovich. Karayev himself received a Stalin Prize for his symphonic poem Leyla and Mejnun (Naxos 8.570720). The liner-notes explain Karayev’s studies of the folklore and traditions of African music and his efforts to ‘use characteristic intonations and rhythms of African folklore’. The extent to which he was successful is somewhat lost on me since I don’t know them. While the ‘eastern’ flavour is easily identified in The Seven Beauties I find the African references harder to discern. However, what can be stated categorically is that Karayev’s music is never less than engaging even though it is light rather than cerebral. No one could argue that this music is not charming and full of often ravishing tunes even though it may not be challenging. There are some wonderfully lilting tunes in this suite, particularly the Scene and Duet with violin and cello representing the two fated lovers against a background of swelling strings as another day dawns. One could easily imagine this nine minute section being used in the same way as was Khachaturian’s adagio from his ballet Spartacus in the UK television series from the 1970s The Onedin Line. The finale which uses the suite’s title is particularly impressive expressing as it does the deaths of the two lovers at the hands of Afrikaners who could not tolerate such a union. It is nice to know that the apartheid laws of South Africa that gave rise to Abrahams’ book motivating Karayev to compose The Path of Thunder are now as much a part of history as the twelfth century of Nizami’s poetry that inspired The Seven Beauties. The Royal Philharmonic Orchestra under Dmitri Yablonsky is in cracking form in music that will appeal to all who like their music uncomplicatedly straightforward yet full blooded.